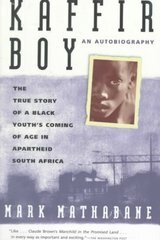 Kaffir Boy 0 Edition The classic story of life in Apartheid South Africa.Mark Mathabane was weaned on devastating poverty and schooled in the cruel streets of South Africa's most desperate ghetto, where bloody gang wars and midnight police raids were his rites of passage. Like every other child born in the hopelessness of apartheid, he learned to measure his life in days, not years. Yet Mark Mathabane, armed only with the courage of his family and a hard-won education, raised himself up from the squalor and humiliation to win a scholarship to an American university. This extraordinary memoir of life under apartheid is a triumph of the human spirit over hatred and unspeakable degradation. For Mark Mathabane did what no physically and psychologically battered "Kaffir" from the rat-infested alleys of Alexandra was supposed to do -- he escaped to tell about it.